Wilmar Homeowner's Tool Set, 75 Pieces, Includes: 8 oz Steel Hammer with Rubber Grip, (2) Screwdrivers: 1/4 x 4 in Slotted, NO 2 X 4 in Phillips, (6) Screwdrivers: 1/16, 3/32, 1/8 in Slotted, NO 0, NO 00, NO 000 Phillips, 12 ft Fractional Readout Tape Measure, Snap-Blade Knife, Torpedo Level, Assorted Fastener Kit and Storage/Carrying Case Set includes 4 in 1 screwdriver, long nose pliers, steel shaft hammer, measuring tape, open end wrench, torpedo level and a zippered pink carrying bag. Versatile fastening tool offers user multiple fastening options in a single tool design; traditional 8" adjustable wrench with laser etched SAE/MM scales and wide jaw opening; Pass-thru reversible ratcheting system works over long threaded rod where normal ratchets and sockets won't fit; every pass-thru socket replaces one standard and one deep; universal design fits 6 fastener types (hex, square, 12pt, E-torx, partially rounded hex, spline). Includes 10 universal combo sockets that fit both standard and metric fasteners: 3/8" (10mm), 7/16" (11mm), 15/32" (12mm), 1/2" (13mm), 9/16" (14mm), 19/32" (15mm), 5/8" (16mm), 11/16" (17mm), 23/32" (18mm) and 3/4" (19mm); sockets are clearly marked for easy identification; for pipe work, the jaw reverses. Simply back the jaw out, turn it around and re-insert. Serrations on the inside edge form a deep touch pattern that hold pipe tight and reduce slipping; corrosion resistant black-phosphate finish; packaged in a convenient storage tray. Contains a complete range of SAE and metric-sized sockets and 1/4", 3/8" and 1/2" drive tools forged from high-quality steel and finished in high-polish nickel chrome or black chrome; ratchet handles are ergonomically designed and have an easy-to-use, thumb-operated reverse-switch mechanism; sockets and extensions remain locked onto the drive until disengaged with an easy-to-reach, low-profile quick release button; Stanley sockets feature "Max-Drive" design, a unique radius corner design which helps reduce fastener wear by minimizing contact on the outer 5 percent of the fastener, helping to increase life expectancy and helps reduce slipping on frozen or rusted fasteners; meets and often exceeds ANSI specification; Includes: (30) 1/4" Dr. specialty bits; (8) 1/4" Dr. sockets; (1) 16' tape rule; (1) 18mm snap-off knife; (1) 1/4" Dr. bit holder; (1) 1/4" Dr. round head ratchet; (1) spinner handle; (1) claw hammer; (1) torpedo level; (1) 6" long nose pliers; (1) 6" slip joint pliers; (1) 2 pt Phillips screwdriver; (1) 6.5 mm flat screwdriver; (8) metric hex keys; (8) SAE hex keys and a blow molded carrying case. (8) Metric hex keys; (8) SAE hex keys; (1) 6" Torpedo level; (1) 5M/16' tape measure; (1) 6" Diagonal pliers; (2) Screwdrivers; (18) sockets: 1/4", 5/32", 3/16", 7/32", 9/32", 5/16", 11/32", 3/8", 7/16", 4mm, 5mm, 6mm, 7mm, 8mm, 9mm, 10mm, 11mm and 12mm; (1) 6" Linesman pliers; (1) 3/8" drive Ratchet Screwdriver; (1) 6" Long Nose Pliers; (6) 2" Spring clamps; (1) 8oz. Fiberglass Claw Hammer; (1) 6" Slip Joint Pliers; (2) 4" Spring Clamps; (3) Driver bits/with 3 pcs bits holder and (1) Blow Mold case. 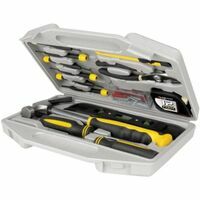 Includes: 3/8" drive, 1/4" drive ratchet handles, 1/4" and 3/8" x 3" extensions, 32 SAE and Metric sockets, 8 SAE hex kit set, multi-bit DuraDriver screwdriver and 12 bits, 12 SAE and Metric combination wrenches, hard case and wrap. Made of full polish chrome plating with sae/mm markings; meets or exceeds ANSI specifications. Includes: 1/4", 3/8", and 1/2" drive tools, (3) ratchets, (64) sockets, (2) extension bars, (8) wrenches, (55) 1/4" drive bits, (12) nut drives, (26) hex keys, folding case for easy storage and mobility. Knurled control ring; polished chrome vanadium finish; "DirectTorque" technology; hand stampedmarkings. Set includes: 1/4", 3/8", 1/2" Drive Pear Head Ratchet; 3/8" Drive 6pt sockets: SAE: 1/4", 5/16", 3/8", 7/16", 1/2", 9/16", 5/8", 11/16", 3/4", 13/16", 7/8"; Metric: 10mm, 11mm, 12mm, 13mm, 14mm, 15mm, 16mm, 17mm, 18mm, 19mm, 21mm; 1/4" Drive 6pt sockets: SAE: 5/32", 3/16", 7/32", 1/4", 9/32", 5/16", 11/32", 3/8", 7/16", 1/2", 9/16"; Metric: 4mm, 5mm, 6mm, 7mm, 8mm, 9mm, 10mm, 11mm, 12mm, 13mm, 14mm. 3/8" Drive, 6pt Deep sockets: SAE: 1/4", 15/16", 3/8", 7/16", 1/2", 9/16", 5/8", 11/16", 3/4", 13/16", 7/8"; Metric: 10mm, 11mm, 12mm, 13mm, 14mm, 15mm, 16mm, 17mm, 18mm, 19mm, 21mm. 1/4" Drive , 6 pt Deep sockets: SAE: 5/32", 3/16", 1/4", 9/32", 5/16", 11/32", 3/8", 7/16", 1/2"; Metric: 4mm, 5mm, 6mm, 7mm, 8mm, 9mm, 10mm, 11mm, 12mm, 13mm, 14mm. 3/8" Drive Extensions: 3", 6", 10". 3/8" Drive hex bit sockets: 5/32", 3/16", 1/4", 5/16"; Metric: 4mm, 5mm, 6mm, 7mm, 8mm. 1/4" Drive Extensions: 3", 6", 10"; 3/8" x 1/4" Reducing Adapter, 3/8" Universal Joint. 1/4" x 3/8" Increasing Adapter, 1/4" Drive Universal Joint. 3/8" Drive Spark Plug socket 5/8", 3/8" Drive Spark Plug socket 3/4", 3/8" Drive Spark Plug socket 13/16". Set includes: (2) 1/4" wrench (sku 751.4466); (2) 5/16" wrench (sku 751.4474); (2) 3/8" wrench (sku 751.4482); (2) 7/16" wrench (sku 751.4508); (2) 1/2" wrench (sku 751.4516); (2) 9/16" wrench (sku 751.4524); (2) 5/8" wrench (sku 751.4532); (2) 11/16" wrench (sku 751.4540); (2) 3/4" (sku 751.4557); (2) 13/16" wrench (sku 751.4565); (2) 7/8" wrench (sku 751.4573); (2) 15/16" wrench (sku 751.4581); (2) 10MM wrench (sku 751.4599); (2) 11MM wrench (sku 751.4607); (2) 12MM wrench (sku 751.4623); (2) 13MM wrench (sku 751.4714); (2) 14MM wrench (sku 751.4722); (2) 15MM wrench (sku 751.4730); (2) 16MM wrench (sku 751.4748); (2) 17MM wrench (sku 751.4755); (2) 18MM wrench (sku 751.4771); (2) 19MM wrench (sku 751.4797); (2) 1" wrench (sku 751.7246); (2) 1-1/16" wrench (sku 751.7253); (2) 1-1/4" wrench (sku 751.7261); (2) 1-1/8" wrench (sku 751.7279); (2) 20MM wrench (sku 751.7287); (2) 21MM wrench (sku 751.7295); (2) 22MM wrench (sku 751.7303); (2) 7MM wrench (sku 751.7329); (2) 8MM wrench (sku 751.7337); (2) 9MM wrench (sku 751.7352). Set includes: (2) 1/2" wrench (sku 751.7360); (2) 10MM wrench (sku 751.7386); (2) 11/16" wrench (sku 751.7394); (2) 12MM wrench (sku 751.7410); (2) 13MM wrench (sku 751.7428); (2) 14MM wrench (sku 751.7444); (2) 15MM wrench (sku 751.7451); (2) 17MM wrench (sku 751.7477); (2) 19MM wrench (sku 751.7485); (2) 3/4" wrench (sku 751.7519); (2) 3/8" wrench (sku 751.7535); (2) 5/8" wrench (sku 751.7543); (2) 7/16" wrench (sku 751.7568); (2) 1/2" x 9/16" wrench (sku 751.7592); (2) 3/8" x 7/16" wrench (sku 751.7600); (2) 5/8" x 11/16" wrench (sku 751.7626); (2) 1/2" x 9/16" wrench (sku 751.7634); (2) 1/4" x 5/16" wrench (sku 751.7659); (2) 3/8" x 7/16" wrench (sku 751.7667). Set includes: (2) 1/4" wrench (sku 751.4805); (2) 5/16" wrench (sku 751.4813); (2) 3/8" wrench (sku 751.4821); (2) 7/16" wrench (sku 751.4839); (2) 1/2" wrench (sku 751.4847); (2) 9/16" wrench (sku 751.4854); (2) 5/8" wrench (sku 751.4862); (2) 11/16" wrench (sku 751.4870); (2) 3/4" wrench (sku 751.4888); (2) 10MM wrench (sku 751.4896); (2) 11MM wrench (sku 751.4904); (2) 12MM wrench (sku 751.4912); (2) 13MM wrench (sku 751.4920); (2) 14MM wrench (sku 751.4938); (2) 15MM wrench (sku 751.4946); (2) 16MM wrench (sku 751.4953); (2) 17MM wrench (sku 751.4961); (2) 18MM wrench (sku 751.4987); (2) 19MM wrench (sku 751.4995); (2) 1" wrench (sku 751.7683); (2) 1-1/16" wrench (sku 751.7691); (2) 1-1/4" wrench (sku 751.7717); (2) 1-1/8" wrench (sku 751.7741); (2) 13/16" wrench (sku 751.7758); (2) 15/16" wrench (sku 751.7766); (2) 20MM wrench (sku 751.7774); (2) 21MM wrench (sku 751.7782); (2) 22MM wrench (sku 751.7808); (2) 24MM wrench (sku 751.7816); (2) 27MM wrench (sku 751.7832); (2) 30MM wrench (sku 751.7840); (2) 7/8" wrench (sku 751.7865); (2) 8MM wrench (sku 751.7899); (2) 9MM wrench (sku 751.7907).